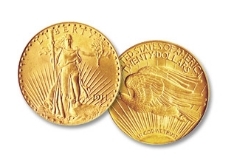 Aurum Advisors is now adding a counterfeit coin pamphlet with the free gold investors guide. “We want consumers to be able to determine on their own what the difference is between a good coin and a coin that is graded or slabbed by a subpar grading service,” says Aurum Advisors President, Marc Lubaszka. It is uncommon for investors to receive counterfeit coins as long as they stick with the two most prestigious grading services in the nation, which are the Professional Coin Grading Service (PCGS) & Numismatic Grading Corporation (NGS). Those are the only two grading services that are used in the new pamphlet, and pictures are provided of what each sonically sealed container that encapsulates each coin looks like. The guide also contains the par code that corresponds to each coin and the hologram that guarantees the authenticity. For more information and to receive the free gold guide, please visit http://www.goldcoinsgain.com/.